Juried by Gerry Snyder, Dean of the Pratt Institute School of Art and Curator of MORE Than Words; Pamela Hovland, Designer and Senior Critic in Design, Yale University School of Art; and Ward Shelley, Performance and Sculptor Artist (Pierogi Gallery). The Westport Arts Center announces a community Call For Entries in support of the theme of its current exhibition MORE Than Words - courage, resilience and empowerment in the face of bullying. 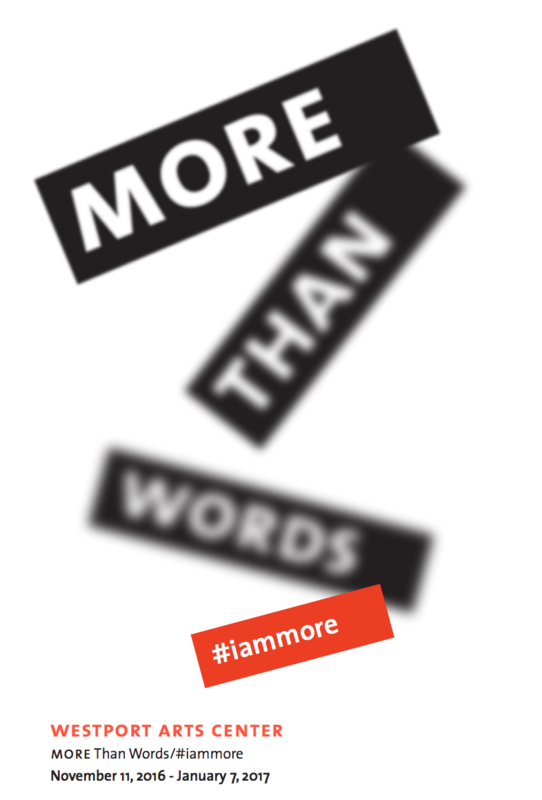 Entries for the second phase of the MORE Than Words exhibition, entitled "MORE Than Words/#iammore", can be submitted now through October 14, 2016. This Call For Entries is open to the general public. Extending the conversation launched with MORE Than Words, the Westport Arts Center invites artists to submit work that examines the idea of bullying within a broad cultural context that considers how the imbalance of social, physical, or political power can marginalize those who are perceived as weaker. Artists have long responded to these inequities through their work, able to speak truth to power in a way not available to others. For this special community exhibition, we are also making a special invitation to young artists, ages 10-17, in a separate, new Junior Submissions Category. Student artists can submit new or previous artwork on the subject of stereotypes, personal identity, or other subjects that address both the struggle and strength required to face all aspects of bullying and power disparities in our lives and in our world. The imagery does not need to depict bullying specifically. MORE Than Words: #iammore is open to adult artists and students. All submissions must be made online. Click here and follow the instructions. For this theme, young artists age 10-17 are invited to submit artwork under the new Junior Category. Each artist may submit up to 2 pieces of artwork. 2-D work, including frame, may not exceed 72". 3-D work may not exceed 72" in any direction. No works may exceed 200 lbs. Images should be 1MB - 4 MB and be uploaded as .jpg or .png. Videos may be up to 500 MB and submitted as .mov, .mp4, or .wmv. Artists may submit their resume, artist statement, and a brief description of submitted works. WAC may edit artist selection based on space limitations. All payments are securely processed with PayPal. WAC will notify all artists by email on Wednesday, Oct 21st at 5pm. No phone calls, please. Your submission to the MORE Than Words/#iammore exhibition signifies your grant of permission to WAC to reproduce work for promotional materials and your acceptance of all conditions stated in this prospectus. All works are insured by WAC while on site through the pick-up date. All proceeds from art sales go directly to the artist after processing fees.